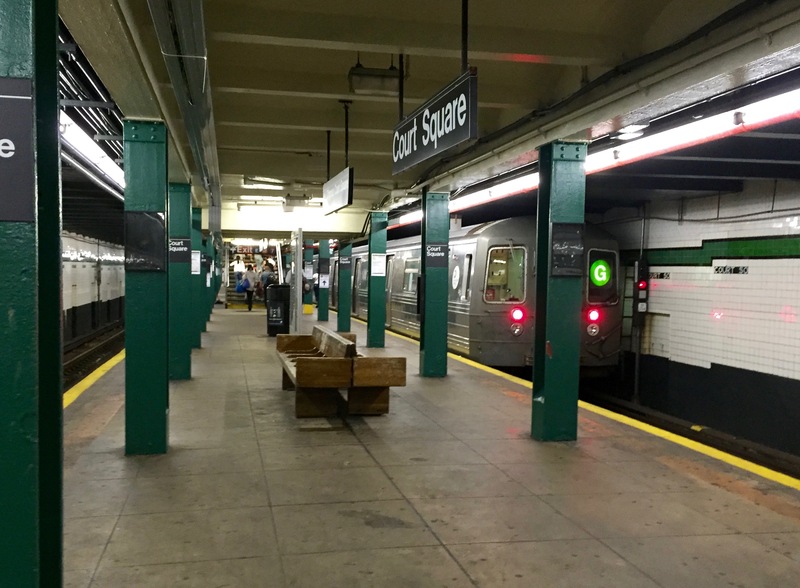 The MTA revealed further details earlier this week of the changes it will be making to the Court Square station as it prepares for the hoards of displaced L train riders during the impending shutdown. The station is expected to see a significant increase in commuters beginning April 2019, when the Canarsie tunnel connecting the L train to Manhattan shuts down for 15 months worth of repairs. About 70 to 80 percent of displaced riders are expected to use other train lines to move about, including the G train, which heads into Court Square’s E, M, and 7 lines. To allow for a more efficient flow of people, the moving walkway at the station, located in the passage between the G and the E and M platforms, will be permanently removed this summer, the MTA said at Monday’s CB2 Transportation meeting. 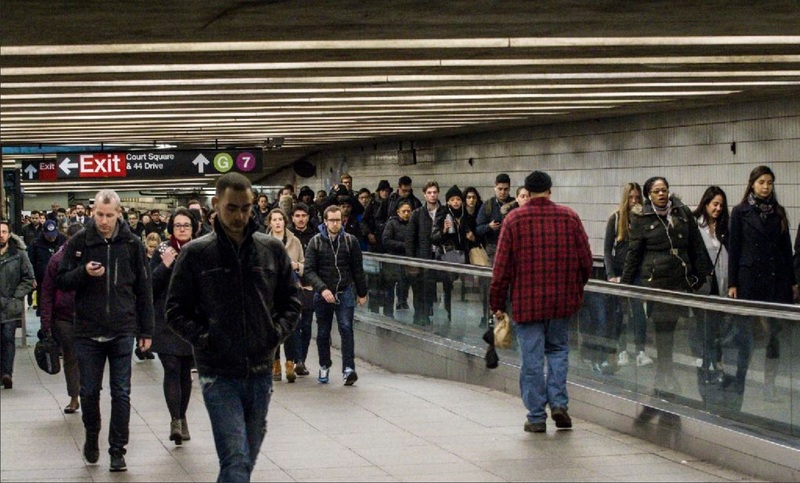 Removing the walkway during the summer, when ridership is at its lowest, will require the MTA to temporarily narrow the passageway by about 40 percent. The agency is looking at some mitigation measures to implement during the removal. In addition, two stairways between the G platform and mezzanine will be widened, and two additional stairwells will be added there, McLane said. Work has already started on these capital projects weeks ago. The MTA said it will hire additional staffers during the shutdown to help direct people through the station and spread passengers through the platform to make sure the trains are fully loaded. In July 2020, when the Canarsie tunnel is expected to reopen, one of the new stairwells will be removed and replaced with an elevator. McLane said one of the additional stairwells won’t be needed after L train project is complete, which allows for the elevator to be put in instead. The G train itself, which currently runs on four cars, will also be extended, although the number of train cars has not been determined yet. The train will also run at an increased frequency. McLane said the answer is not as simple as piling as much people as possible onto the train. Outside of station improvements, free MetroCard transfer will be available between the 21st St G station and the Hunters Point Ave 7 station. Members of CB2’s Transportation Committee expressed concerns about current overcrowding at the station given the neighborhood’s rapid growth, and worried about overwhelming the system even further. But McLane said that by the time work on the Canarsie tunnel starts, two additional 7 trains will be running per hour, as the communications system the MTA has worked almost a decade to install through the line is expected to be completed. McLane added that the E train will pose more of a problem than the 7, since a lot more displaced riders are expected to use that line, which is already over capacity. Still, the Transportation committee looked to the thousands of residential units set to be completed in the neighborhood, and urged the MTA to tackle the displaced L train riders and the growing neighborhood in one shot. “If you gave LIC an express bus through the midtown tunnel, you would help people who live in Hunters Point from getting on the 7 to start with—free up the space for the people coming on the G,” said Mary Torres, a CB2 board member. Torres said by the time the L train is fully back in service, Hunters Point will have outgrown its station, increasing the need for an express bus. 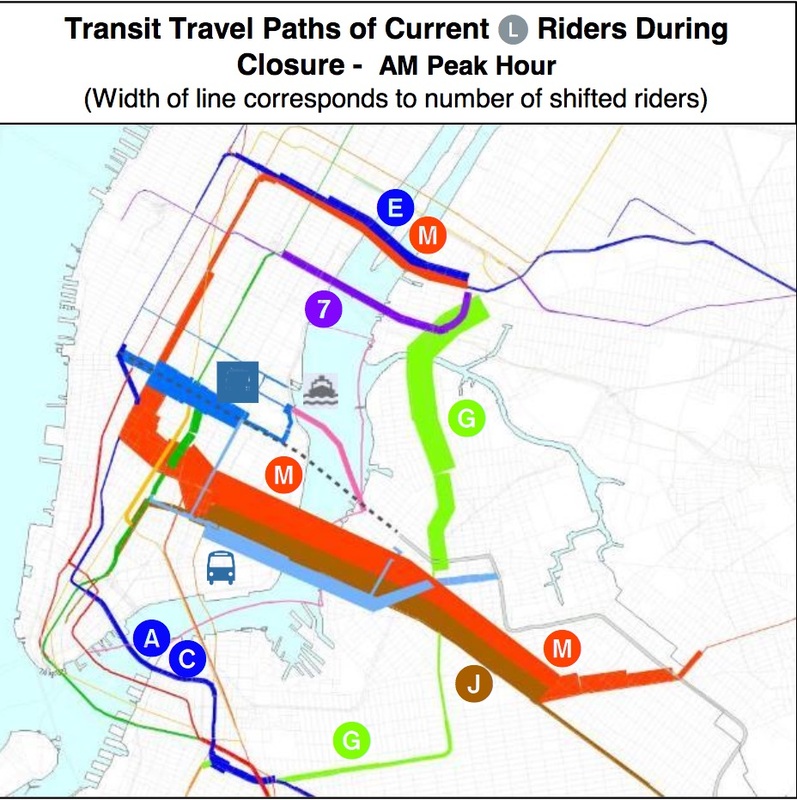 MTA officials said express bus service is generally not implemented when a more direct connection by subway exists, meaning the number of required customers to justify the service is usually not there. In addition, the MTA’s bus depots are all maxed out, and coming up with a new place to store buses requires significant amounts of funding, officials said. Furthermore, the decision to purchase buses has to come from the highest levels of state government, and requires massive support from elected officials and surrounding communities. Still, McLane will be taking some of the committee’s suggestions, like adding a bus service and increasing ferry service at Long Island City stops, back to headquarters. The MTA is expected to return to the community board in the future to present final L train mitigation plans, and to answer some of the questions raised in their meetings with affected neighborhoods. The M is actually being increased to 10tph. However, R service on QBL is being cut to accommodate the extra M service. So it would not suprise me if those extra M trains that pull into Court Square are packed, unable to carry many L passengers. Those 10 M trains per hour will contain only 8 cars each. That is a considerable deficit in rider capacity considering the E trains contain 10 cars each. That’s because the M platforms in the BMT section can’t accommodate 10 car trains. So, there would be passengers on QBL unable to board a train during the peak. Eastbound G train riders would have to cross over to the Manhattan bound platform at Queens Plaza, anyway. So why not have northbound M trains terminate at 57th & 6th during the morning rush? Anyone who wants to take 6th avenue service beyond into Queens can easily transfer to the F train, and the local track would be available for eastbound G service to Queens Plaza and beyond. You can’t just terminate trains at 57 St during rush hour. This would block the F line and cause severe delays down 6 Av Local. However, sending these M trains to 96 St via the Q would work, but then there’s the question of whether the union wants to change around crew schedules for two lines. That makes sense. Also, since the original idea was to have a 2nd line to/from Queens via 6th Avenue (thus the late, unlamented V train), I think it would make sense to have the M run to/from Queens during peak times (rush hour) and still have G service restored to Eastern Queens. Why is there no staircase from the elevated 7 line down to the E line. You have to walk 5 minutes underground. A staircase would take 30 seconds. Those M trains might be emptier but you have to consider that the length of an M train is only 480 feet. The length of an E train is 600 feet. The reason for this difference is because the elevated stations on the Brooklyn half of the M are short and can’t possibly accommodate a 600 foot train. This means that the crowd waiting on the 23rd/Court Square/Ely platform will have to condense on the platform if they have any hope of getting on the M train. Instead of increasing the number of M trains, they should run the G to Forest Hills enabling G passengers to transfer to the R into Manhattan and also enabling G passengers to have a much easier transfer to the M or E using very wide platforms. The entire long walk down that very long hallway at Court Square will not be necessary. Running the G to Queens Plaza and beyond gives riders access to the R train to Manhattan as well as the E and the M. Also Queens Plaza offers very wide platforms plus a quick and easy transfer to all trains. The long walk at Court Square is eliminated. Eric , I mean there are many many people who still get off at Court Square now who continue into Queens also. Anyone who rides these lines knows that. I took the E for 13 years and the Queens Bound platforms were always crowded. Let the Manhattan bound travelers go through the tunnel if they want. (L train riders also) EIther way it will be crowded. If anyone wants to go to Queens Plaza and crossover that is up to them. At least the Queens bound riders won’t be shoveled in with L to G riders and regular Manhattan bound transfer people at Court Square. Don’t you care about the handicapped and elderly who transfer through that tunnel. The MTA obviously doesn’t . Lindsay has the right idea in her comment as does Jo wh said weren’t the walkways to get people to the trains FASTER. The REAL NAME of these walkways are PEOPLE MOVERS remember !!!!!!!!!! It’s already ridiculously crowded going from that corridor to the E/M and on that platform. I can’t imagine adding even one more train car of people to that mess. Larger stairs just mean fewer people by the G and even more people waiting for the E/M on platforms that already can’t fit the current Queens crowd. Seems like a disaster waiting to happen. They really have no plan and it’s going to be hell. This is good because that thing is out of order half the time anyway. I still think the G should run further into Queens again because that would eliminate a lot of the transfer woes that station is going to see. The MTA’s resistance to running an express bus through the Midtown Tunnel during 7 train outages and soon the L train shutdown is mystifying, and there constant excuses make no sense. I just don’t understand their refusal to do this. They are a public transit organization, aren’t they? Years ago, they DID run buses into Queens from Manhattan when the 7 wasn’t running. It worked well then, and it would now. These are the most asinine ideas I have heard of. Sure, the moving walkways are frequently out of service. To remove them without an alternative (better moving walkways) is stupid. I see handicapped and elderly people riding/walking when they don’t work through that tunnel. Uncaring MTA . Just run the G into Queens and no need to transfer to E at court square. One more stop is Queens Plaza where E is accessible on the same platform. Why walk through that tunnel? DUMB Ideas, keep hurting Queens riders for Brooklyn riders, stupid. The moving walkways are ridiculous but an easier fix would be to reverse them – they’re on the wrong side of the path. People have to go against the normal traffic because it’s on the left side and this causes people to all cross paths and bump into each other at both ends of the hall. If they’re reversed then people will still move quickly but with traffic. Your suggestion to extend the G into Queens, as it traditionally had run, is unworkable. Most displaced L train riders will be utilizing the G on their way into Manhattan not further into Queens – which is what your suggestion, as you wrote it, would accomplish. Contrary to your assertion, passengers would have to cross over to the Manhattan-bound platform at Queens Plaza. The MTA built the transfer tunnel between the G and E/M/7. That was a sensible project. Removing the moving walkway will free up the space it’s currently occupying for walking. So far, their plan is sound. Let’s see what else they propose. The MTA is going to rely on the already jammed 7 and E trains to handle most of the L train’s capacity. That is simply ludicrous. Running a few extra cars on the G is all they got to offer? They need to add significantly more transit capacity, not just shift the burden to parts of the system straining at the seams. Essentially, they are making the L train shutdown LIC’s problem. Where is the original thinking? actually, the M train in Queens (from 71 Av to Manhattan thru Queens Blvd) frequency will also be increased to about 15 trains each hour (matching the E train frequency), so those M trains would be emptier and can handle some of those crowds. Yes but the M is going to go to the upper east side on weekends, which is a huge insult to Queens riders and displaced L commuters who will have significantly less service at Court Square. That many extra M trains will prove interesting after 53rd and 5th when they try to cram them onto the 6th ave line. The M already stops in the tunnel nearly every time to allow trains crossing in front. There’s no way M service can be upped to 15 tph. 71 Av is pretty much at the limit to sending and terminating trains. The only terminal that could handle this is 179 St, but Queens Blvd Exp is also at the limit.